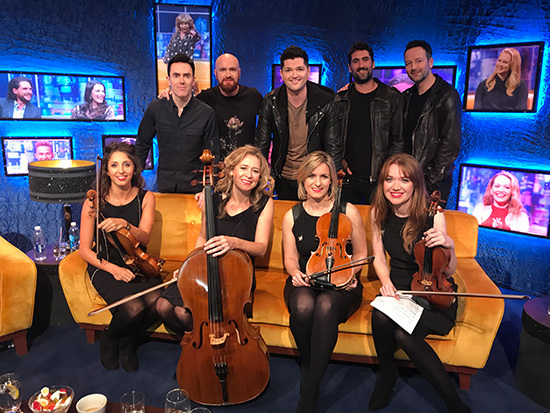 Last week we had a busy week with THE SCRIPT writing and recording a string arrangement for their hit ‘ARMS OPEN’ taken from their Number 1 album, ‘Freedom Child’. We went on to perform this arrangement with THE SCRIPT live on JONATHAN ROSS. String arrangement written by Rosie Danvers, Performed by Wired Strings, Strings produced by TommyD, Engineered by Nick Taylor and Recorded at Air Edel, November, 13th, 2017.